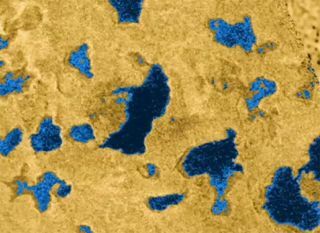 This image shows bodies of liquid near Titan's north pole. It show that many of the features commonly associated with lakes on Earth, such as islands, bays, inlets and channels, are also present on this cold Saturnian moon. Anocean seasoned with the chemical ingredients of life may lie hidden beneath theicy surface of Saturn's moon Titan. Theevidence? The entire surface of Titan appears to be sliding around, scientistssay, like cheese over tomato sauce on a slice of pizza. Titanis the largest of the more than 50 known moons orbiting Saturn, and is in fact bigger than theplanet Mercury. Titan possesses a thick, planet-like atmosphere ? the only moonin the solar system known to have one. And the Cassini-Huygens mission toSaturn and its moons revealed a surface at Titan covered with icy mountains,oily lakes and seas and what might be "cryovolcanoes" that spewplumes of water and ammonia. Scientistshad long suspected that an undergroundocean might exist on Titan, much as Jupiter's moons Ganymede, Callisto andEuropa do. "Modelsof heat flow in Titan's interior suggested years ago that Titan would likelyhave an internal water or water-ammonia ocean," said Ralph Lorenz, a Cassini radar teammember at the Johns Hopkins University Applied Physics Lab in Laurel, Md. Lorenz and his colleaguesanalyzed several years' worth of radar data from the Cassini-Huygensmission. They found evidence that some features on the moon's surface haddrifted. "Aswe were mapping Titan's surface, we were building maps up in little strips.Some of these strips overlapped, help tying the map together, but when youlooked at where the features were in one strip compared with another strip, thecoordinates weren't the same," Lorenz explained. Theirresearch suggests that winds in Titan's dense atmosphere might actually rockthe moon back and forth on its axis, influencing how it spins. The winds canaccelerate the small moon's rotation speed and then, as the winds change withthe seasons, they can decelerate it. "Titan'swinds should spool up and spin down with the seasons, and because Titan'satmosphere is so massive and Titan is relatively small, the winds have ameasurable impact on Titan's rotation," Lorenz said. "If you adjust theparameters of how Titan rotates very slightly, we could make the features onthe maps match up." Windsactually sway the rotation of Earth too, changing the length of the day byroughly 1 millisecond over the course of the year. "But Titan'satmosphere is so massive and its crust is light, so the changes are much biggerthere," Lorenz explained. Thesize of these shifts hints that Titan's crust and core have to be separated bya liquid ocean to allow the atmosphere to move the crust around. Titan is about 3,200miles (5,150 km) in diameter. The hidden ocean may be 60 to 120 miles (100 to200 km) thick and its ice crust may be 30 to 90 miles (50 to 150 km) thick,Lorenz said. Beneath that may be a few hundred miles of a heavier form of ice"that you get at higher pressures," he explained, on top of a rockycore roughly 1,800 to 2,100 miles (3,000 km to 3,400 km) wide. Thisunderground ocean is likely mostly water with a dash of ammonia. As organicmolecules ? the chemical ingredients of life on Earth ? have been detected onTitan's surface, it may be they are in the ocean as well. "Whetherlife has ever evolved on Titan is another question, but whether it did ordidn't, Titan can tell us about the chemical processes that ultimately lead tolife," Lorenz told SPACE.com. Cassinimay make magnetic and gravity measurements that show more evidence of an ocean,"but in the future it would be ideal to put a long-lived lander on Titanwith a seismometer to detect the ocean that way," Lorenz said. "ESAand NASA are right now evaluating such a mission for launch in the 2017timeframe." However,there might be another explanation other than a hidden ocean behind thesefindings. Titan might have a reoccurring wobble in its orbit, said NASA Jet PropulsionLaboratory planetologist Christophe Sotin, who did not participate in this study. Toconfirm if Titan has an underground sea or not, Sotin said, Cassini would needto observe that moon for another six years to see if its spin slows down, aswould be expected if there was a subterranean ocean. "Ifthere is the presence of an ocean there, with a pressure and temperature verysimilar to Earth's oceans, the question of life is now open for Titan,"Sotin said. Lorenzand his colleagues detail their findings in the March 21 issue of the journal Science. Staff Writer Andrea Thompson contributed reporting to this story.